The temporomandibular joint (TMJ) is a complex joint that allows for the mouth to open and close. It consists of the temporal bones, which are part of the skull, and the mandibular bone that is part of the jaw. Its complexity stems from the fact that it is a sliding and hinging joint, it is bilateral, one on each side of the head, and it is moved mainly by two sets of four different muscles on each side of the head: the masseter, medial pterygoid, lateral pterygoid and temporalis muscle. Pain and dysfunction of the temporomandibular joint is often referred to as TMJ. This is not correct however. TMJ is actually the name of the joint and the pain of this area is referred to as temporomandibular joint disorder, dysfunction, or syndrome. TMJ Disorder can consist of pain upon chewing, opening and closing the mouth, a locking of the joint or inability to fully open or close the mouth, popping and clicking noises, headaches, muscle spasms, and pain in the face, ear, jaw or mouth. There are 3 million reported cases of TMJ Syndrome in the United States each year. Traditionally, people plagued with TMJ issues will visit their primary doctor or dentist to receive treatment. Treatment consists of medicine to reduce inflammation, relax muscles and decrease pain. Some people use a night guard to prevent grinding teeth and tensing the jaw while sleeping. More recently, it is become known that chiropractic can help restore function to the TMJ and neck to aid in fixing the problem, rather than temporarily reducing the pain and dysfunction. In October 2011, a 17 year old, female, high school student presented to the office with TMJ pain. It presently was on the left, but could switch from side to side. Upon opening and closing her mouth to eat and talk, it would create a sharp, painful, pop and click. She estimated the pain had been there, daily, for about a year and ranged from a mild 3/10 on the pain scale to 10/10 when there was a flare up. She had never injured the area or her neck. Prior to this, she had consulted with her dentist and an oral surgeon. A night guard was recommended to prevent her from clenching her teeth at night, but was not successful. It was noted in her consultation that she had her wisdom teeth removed in December 2010. Overall, the patient was a healthy, active teenager. At first glance, the patient had a symmetrical face. No side of her jaw protruded more and there was no rotation in her chin or head. All ranges of motion of her neck were within normal except for decreased extension, ability to look up, and right rotation of her head. Upon palpation of the neck and muscles surrounding the TMJ, the left masseter muscle, essential for raising the lower jaw during chewing, was significantly tighter than the right masseter muscle. Muscle spasms were located along both sides of the neck and at the base of the skull. Palpation of the temperomandibular joint while the patient slowly opened and closed her mouth revealed the right TMJ would start moving first, followed by the left and the entire jaw would shift slightly to the left. 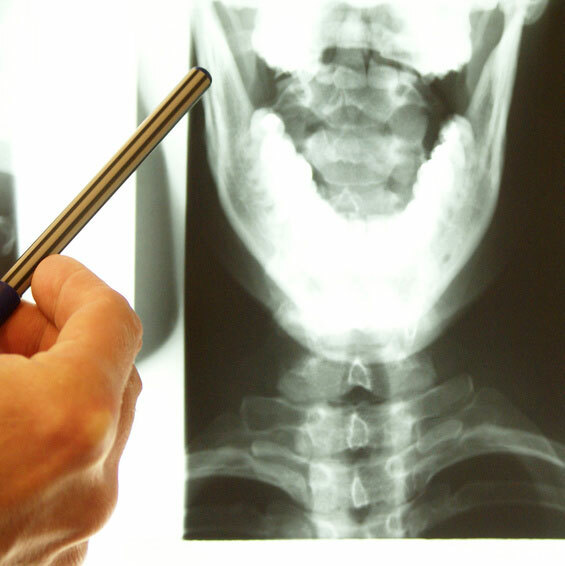 Subluxations, or misalignments of the joints, were located in the jaw and multiple segments of the neck. The patient’s examination clearly showed that multiple subluxations of the neck and jaw and spastic muscles were contributing to her painful popping and clicking jaw. The patient and her mom decided to begin chiropractic care right away. Her treatment plan consisted of 15 chiropractic adjustments and soft tissue therapy over 9 months. She came in for treatment 2 times in the first week, once a week for the next 4 weeks, then at two weeks, three weeks, three weeks, then once a month for three months. Her visits became less often as her pain levels decreased and the alignment of her jaw and neck would stay in place longer and longer. An Activator Adjusting Instrument, or spring loaded instrument, was used to deliver the Chiropractic adjustment. This devise is very specific and gentle and especially effective in pinpointing a tiny joint like the TMJ. Using the Activator Protocol, it was determined that the patient’s left TMJ was subluxated, or misaligned, in three directions, superior, medial, posterior. After every adjustment, it would be followed by pressure point therapy of the upper back, shoulders and neck to release the tension of the muscles and decrease spasms. Myofascial Release Technique (MRT) was performed on the neck, upper back and jaw. The patient was given specific home care instructions that included neck and jaw stretches, avoid eating hard foods or foods that require one to open the mouth wide (whole apples, corn on the cob), and massage of the muscles in the mouth. Monitoring her stress levels was also important to prevent her from clenching or grinding her teeth and tensing her muscles. After the patient’s first adjustment, she reported that her TMJ was not as painful, but just felt like it needed to stretch. At her third visit, she stated that she had no pain for two days following the last visit. On her fourth visit, there was no pain since, but had the need to stretch or massage it often. The jaw was still cracking loudly however. By January of 2012, the patient had received 9 treatments. She had made it through finals, a very stressful time for her, without any pain. She did remember to stretch and massage regularly. By June of 2012, the patient was coming in for monthly checkups and was happily able to report that her jaw was pain free and was no longer cracking and popping. When the patient returned in October 2014, for a different issue, she reported that her jaw was still pain free with no popping or cracking. While this patient responded very quickly to care in the beginning, this is not normal for all people. A similar case was observed in 2013, when an overweight, 46 year old, sedentary female presented to the office with TMJ pain after biting into an apple several weeks prior. The same examination and treatment plan was implemented. While she was also instructed to perform specific stretches and massages at home, she would only do them every couple days. She was without pain and eating normally by the two month mark, but the pain level decreased much more gradual. The fact that original patient of discussion was young, healthy, injury free, very diligent with her home care instructions and came to all of her appointments, most likely made her care that much more effective and successful. In conclusion, Chiropractic, and specifically the Activator Adjusting Instrument, is an effective method to treat temporomandibular joint pain and remove the problem to restore proper function.